New on the water for 2006, Bar Crusher’s super-tough 560WR walks all over its centre-cab / walk-around competition. 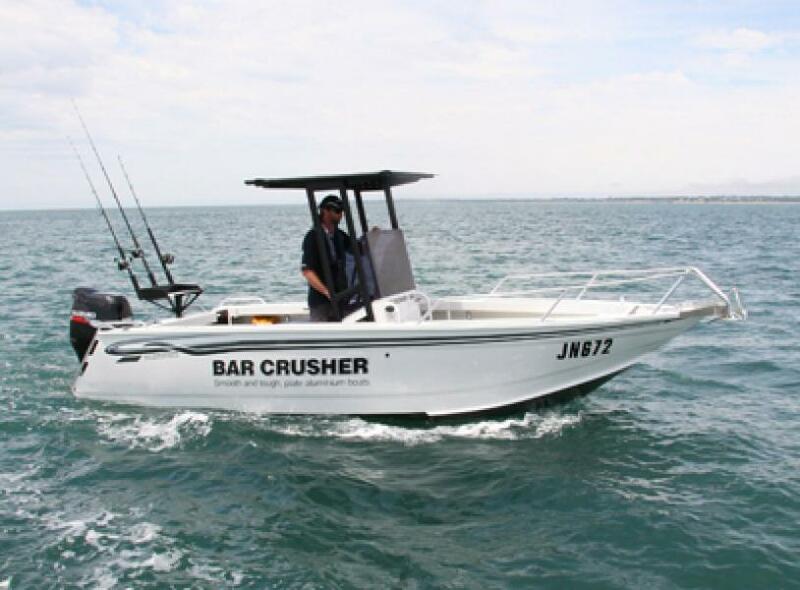 Constructed from heavy duty, pre-stressed 4mm (bottom sides) and 3mm (top sides) marine grade plate aluminium, this awesome sportfishing rig follows in the footsteps of every Bar Crusher model to deliver the smoothest ride of any aluminium boat on the market. Measuring 6.10m LOA, beam 2.25m, the 560WR’s ultra-smooth ride is the result of its high-tech Waveslicer™ non-pounding, deep-V hull, which slices through chop and performs brilliantly in a following sea. The expertly-engineered Rigideck™ sub-floor system also ensures maximum hull strength for crew confidence in all conditions. Unlike most deep-V boats, the 560WR is extremely stable at rest, thanks to Bar Crusher’s exclusive Quickflow™ water ballast technology. A cavity that runs the full length of the keel quickly fills with water when stationary, which lowers the chines into the water for greater stability, and drains in seconds as the boat moves forward to allow it to leap effortlessly onto the plane. Rated to carry a 115-140hp outboard, the 560WR’s superior performance capabilities, 150lt fuel capacity and spacious walk-around configuration will see it find particular favour among anglers chasing inshore pelagics and reef fish all around Australia’s coastline. Rod holders, livebait tank, in-floor fish storage tank, berley bucket, large-volume storage pockets and an easy-to-clean checkerplate deck are among a long list of standard fishing-related features. Complete with step-through transom, marlin board / swim platform and a swim / dive ladder, the 560WR is also ideal for family days on the water.